Don’t be sleeping in today. Because it’s IGHR registration day today. Now… because it’s a new system with a new venue, here’s what you need to look for. First, navigate to the IGHR 2017 courses page here. You can either click on the course page link (on the left) and then look for the yellow registration button to appear all the way towards the bottom of the course description at the right time (you may need to refresh the page) or look for the button to appear in the registration column (on the right) and click on it (and again you may need to refresh the page). 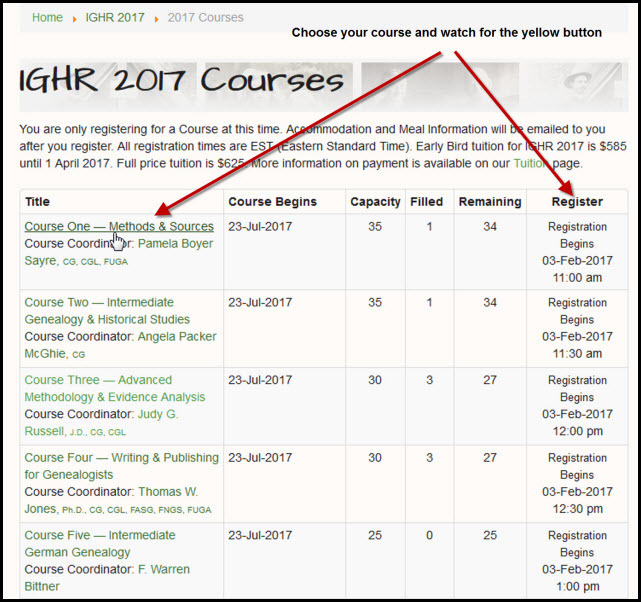 To register for a course, go to IGHR 2017 –> Courses and select either 1) the Register button or 2) the course. If the Register button is selected from this page when the course opens, the Registration form displays. If the course is selected, the course information page displays. At the time registration opens, a yellow Register button will display. This button will not display until registration opens for that course. Once registration opens, the button will be visible and active. Selecting the Register button opens the Registration form. We will have Waiting Lists for courses that are full. All we are asking during your initial registration is for your basic information and payment. It will be a quick and easy process. Since you are working from the course page of your choice, you will not have to enter any course information. All other IGHR registration or information will be obtained from you later. Payment can be made by credit card through PayPal (a PayPal account is not required) or be paid by mailing your registration fee. And since it’s a new system with a new venue… please understand if there are a few glitches. It’s only to be expected.